For the fourth year in a row T-pub is organizing the St. Patrick’s Day party. If you are a lover of Irish culture and music, come to T-pub to celebrate the biggest Irish holiday. This year the St. Patrick celebration will last for three days. Real Irish music, dance, film and atmosphere, plus a choice of excellent beers including Irish Guinness and cocktails, these are all great recommendation for spending St. Patrick’s Day at T-pub. 15th March – Sunday. Pub opens at 2 p.m. and starting from 4 p.m. you can watch the World Cup match between Celtic and Dundee United. From 7 p.m, as a part of Belgrade Irish Festival, you can join a free Irish language (Gaelic) class. There will also be discussions about Irish poems, writers and the influence of Irish language on history and culture. 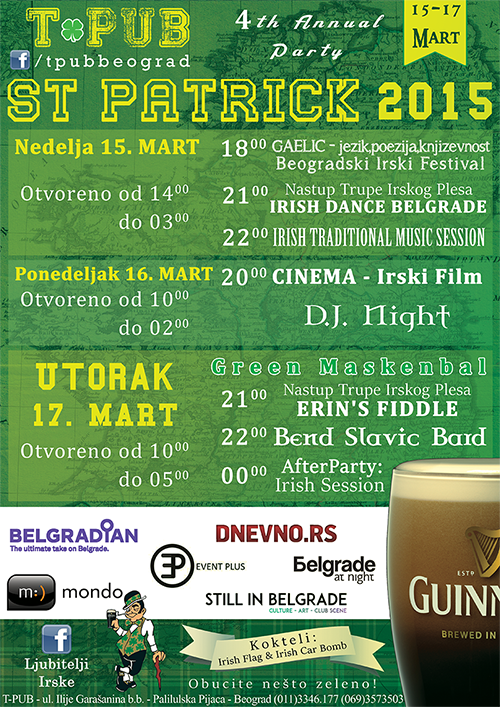 At 9 p.m. there will be a performance of Irish dance company, Irish Dance Belgrade, and at 10 p.m. there will be Irish Traditional Music Session with experienced musicians from Belgrade Irish scene and other cities. 16th March – Monday. Pub opens at 10 a.m. At 8 p.m. there will be a film projection of a movie chosen by our guests via the Facebook page. Before and after the projection, DJ will play Irish music. 17th March – Tuesday. Pub opens at 10 a.m. Starting from 8 p.m. you can join the costume party with Irish culture as the theme, organized by dance company Erin’s Fiddle. The dancers will make sure everyone without a mask gets make – up on, and also that there are sweets and snacks. The band Slavic Bards will play Irish rock – punk music, starting from 10 p.m. After midnight there will be an After Party Irish Session until 5 a.m.
We would also like to point out that for the first time this St. Patrick’s day, thanks to the Belgrade Irish Festival , Belgrade will become part of the global Irish greening of the world sights by making the Ada bridge green at dusk.